This delicious recipe has been generously shared by one of our great cooks, Carina. She’s always coming up with great recipes which she either invents herself or adapts from various cookbooks to make her own. Carina is a huge source of inspiration to our Lovefoodies Facebook group and always has a tasty recipe or two to share with us. Here, we have Carina’s Homemade Bagels. Her original source for this wonderful recipe was adapted from the cookbook ‘Essentials of Baking’ by Williams – Sonoma. 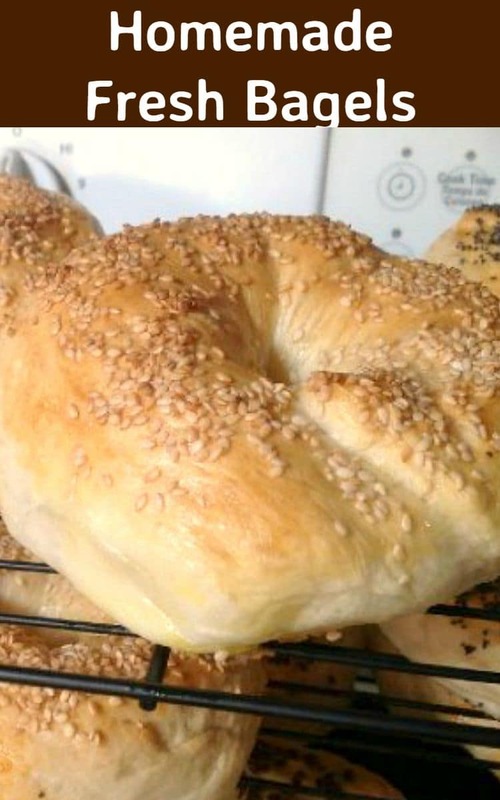 Carina has added several tips and tricks along the way and explained how she has used the cookbook as inspiration fro her Bagels. 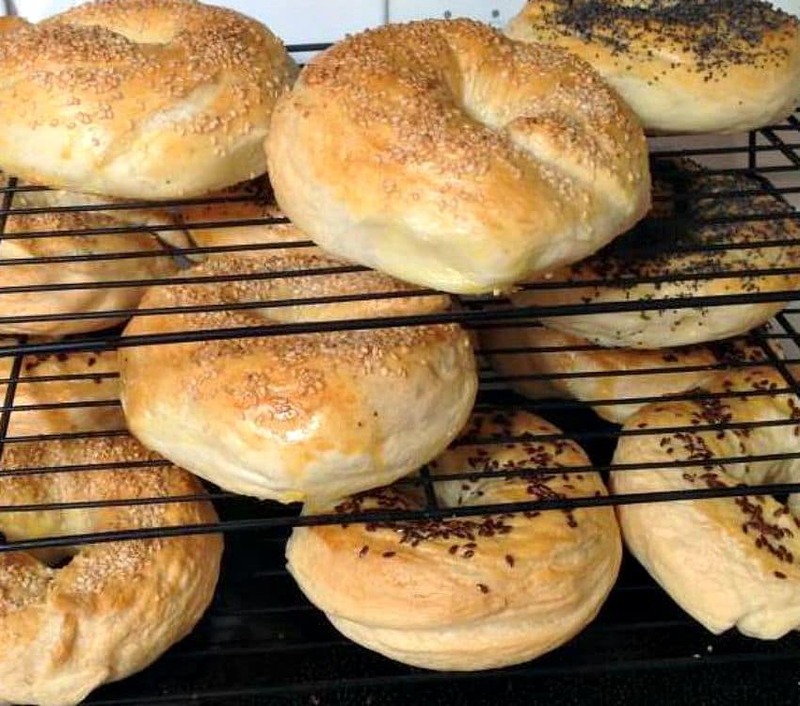 So without further ado, let’s see how Carina makes these delicious Homemade Bagels! 1. In a saucepan combine the potatoes and water, bring to boil and cook until fork tender,..drain and RESERVE THE WATER! 3. Measure two cups of the potato water into the bowl of the mixer and let cool to warm (110F/43C). 4. Dissolve the yeast in the warm water and let stand until foamy (about 5 minutes). 5. Add the oil and eggs and combine using a wire whisk. 6. Whisk in 2 cups of the flour and the salt until smooth ( a couple of minutes). 7. Place the bowl in the mixer, attach the dough hook and mix the remaining flour, 1 cup at the time until forming a soft dough. Knead the dough at LOW speed until smooth and elastic ( 5 to 7 minutes). 8. Remove the dough from the bowl, form into a ball and transfer to a lightly oiled bowl, cover the bowl with plastic wrap and let it sit for about an hour. 9. Punch down the dough and turn it to a lightly floured surface. Cut into quarters, and each quarter into 3 equal pieces. Using your palms roll each piece into a rope about 10 inches (25 cm) long. Using the heal of your hand flatten 1 inch of one end of each rope and form each bagel by overlapping the flat end of the rope over 1 inch of the other end that is round. 11. Fill a large pot with a water and bring it to boil. Reduce the heat and maintain a gentle boil. Using a large slotted spoon, gently lower a few bagels into the water. Do not crowd the pot. Simmer 1 minute, then turn over and simmer for another minute. 12. Transfer the bagels to the pan that will go in the oven ( using parchment paper is the best). Do the same with all bagels. Space them about 1 inch apart on the pan. Brush them with the beaten egg and sprinkle the seeds. Be ready to be amazed at how awesome they are! For serving ideas I would suggest toasted with cream cheese or sandwiches. I have them often with a fried egg and cheese My husband loves them with my homemade peanut butter. In a saucepan combine the potatoes and water, bring to boil and cook until fork tender,..drain and RESERVE THE WATER! Measure two cups of the potato water into the bowl of the mixer and let cool to warm (110F/43C). Dissolve the yeast in the warm water and let stand until foamy (about 5 minutes). Add the oil and eggs and combine using a wire whisk. Whisk in 2 cups of the flour and the salt until smooth ( a couple of minutes). Place the bowl in the mixer, attach the dough hook and mix the remaining flour, 1 cup at the time until forming a soft dough. Knead the dough at LOW speed until smooth and elastic ( 5 to 7 minutes). Remove the dough from the bowl, form into a ball and transfer to a lightly oiled bowl, cover the bowl with plastic wrap and let it sit for about an hour. Punch down the dough and turn it to a lightly floured surface. Cut into quarters, and each quarter into 3 equal pieces. Using your palms roll each piece into a rope about 10 inches (25 cm) long. Using the heal of your hand flatten 1 inch of one end of each rope and form each bagel by overlapping the flat end of the rope over 1 inch of the other end that is round. Fill a large pot with a water and bring it to boil. Reduce the heat and maintain a gentle boil. Using a large slotted spoon, gently lower a few bagels into the water. Do not crowd the pot. Simmer 1 minute, then turn over and simmer for another minute. Transfer the bagels to the pan that will go in the oven ( using parchment paper is the best). Do the same with all bagels. Space them about 1 inch apart on the pan. Brush them with the beaten egg and sprinkle the seeds. Just wondering, do you use all purpose flour or bread flour for this recipe? Can’t wait to try these! Hi Elizabeth, these are delicious! 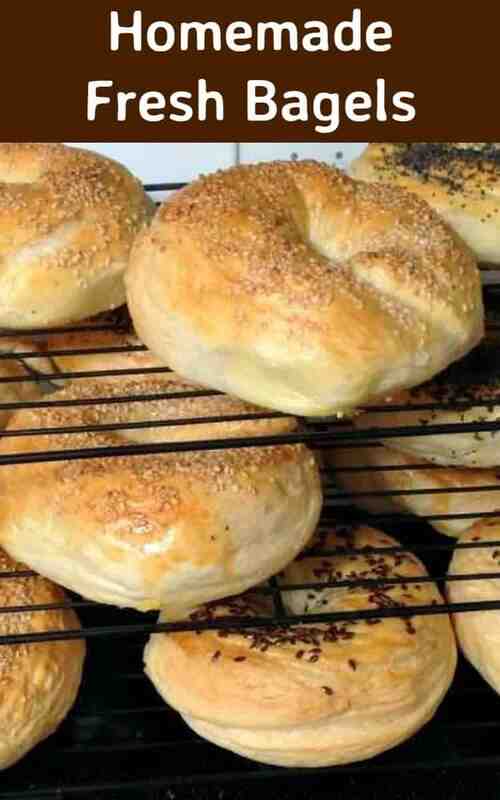 (Check out the Montreal bagels at the end of the recipe too, they’re a slightly sweeter bagel!). I’ve used all purpose and also strong white bread flour. You can use either, I personally prefer the strong bread flour for a chewier texture! 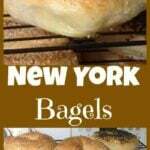 Please do enjoy, they’re lovely bagels! Can these be made with cheese in them and/ or on them and if so how would that alter cooking? Jalapeno cheddar and cheddar cheese are family favorites. I can’t wait to try these. Hi Julie, you could combine some grated cheese in to the dough before you shape them, and / or also sprinkle some grated cheese on the tops when you come to bake them to give them a nice topping. I don;t think the cook times will be much different, if at all. I would suggest when you boil the first bagel, check after the stated cook time for if it is ready by opeing it up. If not, then simply add a minute or two extra and test again. I hope that is helpful for you! I’m making these right now. Can I freeze the dough? And when? I was thinking to freeze them after I boil them. Hi, yes, you should be able to freeze them no problem, and I also would do as you suggested, after boiling, then you simply defrost and bake when you’re ready! Also, I forgot to mention, when freezing, I would put some parchment inbetween them to stop them from sticking together as the starch from the water after boiling does make them a little sticky. I can’t wait to try these!! Just wondering if it’s necessary to use boiled potato water or if I can just use warm water? Ok, thanks! Going to try these soon! That sounds great! Next time you make them I’d love for you to send some photos in of how you shape them. It would be nice to add your guide to our recipe to help others. Thank you for sharing Bonnie. WHY IS THERE NO PRINT OPTION. Hi Michelle, don’t worry! There is a Print icon on every page, top right, just sitting above the menu bar so you can print away! If you still don;t see it, let me know and I will email you a screen shot to help you find it.